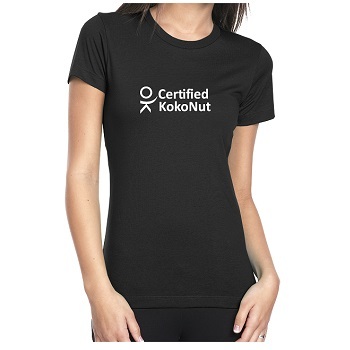 The Certified KokoNut Tee Shirt is designed for members who have completed a personalized Program Track. Printed front and back in white. 100% combed cotton jersey, 4.3-oz. made of premium single knit cotton for extreme softness. This shirt is designed spefically for ladies and is a slim cut. For size chart information please email stacy@trmiller.com.